Button is a ContentControl, which means that it can contain exactly one child control. The child element can be any .NET object. A simple string is the most common content for a Button. Examining the Button control at runtime, you can see that its stores an instance of a string in its Content property. 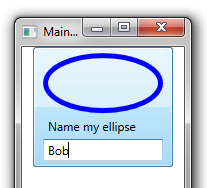 Also note that the base type of Content is object, meaning that the button could store any .NET object as its content. And here’s a Button that uses a StackPanel to host several child controls.